The magnificent walls of Old Jerusalem. Find out all about them. There are fourteen stations along Christendom's most sacred route - each one marks an event that took place during the last walk before the Crucifixion. Western Wall Tunnels - In the nineteenth century, the most distinguished Jerusalem scholars were already trying to determine the precise measurements of the Western Wall and describe the methods used in its construction. It is the holy place most venerated by Jews, as it is the only remnant of the Second Temple, which was destroyed by the Romans in A.D.
Jewish Quarter - The Jewish Quarter offers the visitor unforgettable ancient sites, picturesque streets and synagogues with a unique character. Also known as the Ophel. Many legends are attached to the City of David. 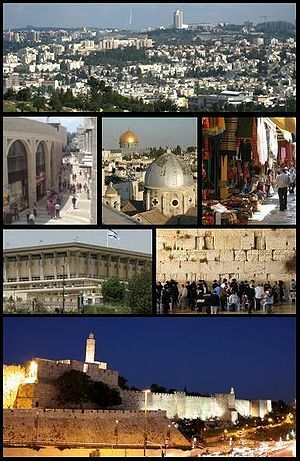 The city is the historical site of King David's palace. Jerusalem Pedia is part of the AdBrite advertising network, the largest independent networks on the internet, connecting quality advertisers to 100 million viewers each month on 112,066 websites.